Members and visitors of Royal Protector Chapter No 3471 were most honoured to welcome Ian Higham, Third Principal Grand Principal to their installation meeting. Pictured from left to right, are: David Emmett, Ian Higham, John Phillips and Charles Makinson. Ian was accompanied by Assistant to the Provincial Grand Principals Colin Rowling, South Eastern Group Chairman Gareth Jones and fellow grand officers Brian Hayes, Tony Johnson and Mike Adams. Provincial Deputy Grand Director of Ceremonies Mark Barton and Provincial Grand Steward Jim Hardman. Also, in attendance were other officers from Provincial Grand Chapter along with and other visiting companions. First principal Sylvester During opened the convocation and efficiently dealt with the routine chapter business and then PrDGDC Mark Barton entered followed by Ian and the rest of the Provincial grand officers. Past first principal John Phillips was then installed as first Principle for the ensuing year with the second and third principals, David Emmett and Charles Makinson, on this occasion being proclaimed and remaining in their respective offices for a further year as likewise, were all the other chapter officers. John, having been installed as first principal and the ceremony completed, Ian rose and brought the congratulations and the good wishes of the Grand Superintendent Tony Harrison, individually congratulating each of the three principals and wishing them, their officers and companions in general, a happy and healthy year ahead. Ian responding at the festive board. John then presented a cheque to Ian for £200 made out in favour of the Masonic Charitable Foundation to which Ian responded by thanking the chapter on behalf of the charity and on behalf of those who we may never know or meet that will ultimately benefit from the very kind generosity of the members of Royal Protector Chapter. The first rising brought greetings from the grand officers to which Colin Rowling responded and similarly congratulated the companions on their generosity and complimented them on an interesting ceremony during the evening which the grand officers had been delighted to attend. 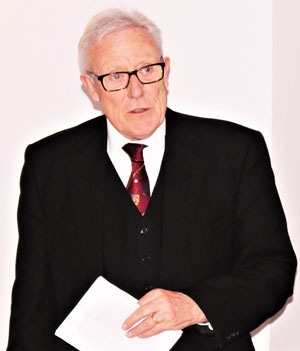 During the festive board, Ian gave an excellent response to his toast offering his own congratulations to the chapter and saying how he had enjoyed the meeting which had been well and efficiently carried out. 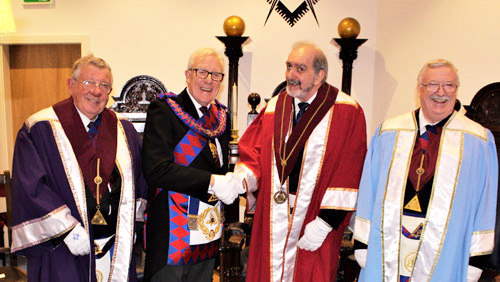 He commented on the target for membership of the Royal Arch in the Province and its importance in the overall Masonic structure, being the finishing touch to the third degree. Ian also made reference to the MCF 2021 Festival and how important it was for all Masons to contribute and attain their Stewards Jewel and how the Province was a net receiver of from the charity. The friendly and jovial festive board continued well into the evening thus bringing to an end a most enjoyable convocation. Pictured from left to right, are: Tony Johnson, Jim Hardman, Ian Higham, David Emmett, John Phillips, Charles Makinson, Colin Rowling, Brian Hayes and Mike Adams.